The third round of the main event. Two devoted, fearless boxers trade leather before falling into a kind of bewildered hug. Then, briefly, Eric Donovan looked up and glanced around. Fleeting recognition of his big stage. A stage that was long awaited. It's been 11 years since he just missed out on the Olympics. A trauma that has haunted him ever since. Tonight was a big step towards redemption. A stadium main event title fight on national television. A second chance that could not slip again. He hails from Kildare, but the National Stadium may as well have been his back garden. Throughout the bout he reigned supreme, eventually finishing it in the fourth round. It was a level of class was evident from the very first round, slipping shots without showing much the other way. A round later he peppered McAfee's frame and drew blood. The Dubliner returned the favour a round later, but it did little to halt a drive towards a dream. If boxing is war with fists, Donovan may as well be a lieutenant. To finish it, his weapon of choice was a left hook. It brought McAfee to his knees and the stadium to its feet. Donovan lands a crippling bodyshot & its over!! "A proud and special moment for me and my family," he declared after the fight. Atonement articulated. On the undercard, Allan Phelan monstered a dogged Aiden Metcalfe with a sixth-round stoppage victory. Katelynn Phelan followed it up with a debut victory. Then came the co-main event. Dubliners Victor Rabei and Jake Hanney battled for the Celtic super welterweight title after exchanging back and forth in the build up. While the weeks of smack talk counted for little, who smacked harder certainly did. A buzzing Hanney edged the early rounds without ever troubling Rabei. It was a hornets attack without any sting. A teasing prance in the fourth showed as much. By the sixth, the Moldovan-born brawler was on top and cruising. A 79-73, 77-75, 78-75 decision in Rabei's favour duly arrived. Confident and competent, it's bigger and better things ahead. It was a night that Dublin boxing sorely needed but one that came at a cost. 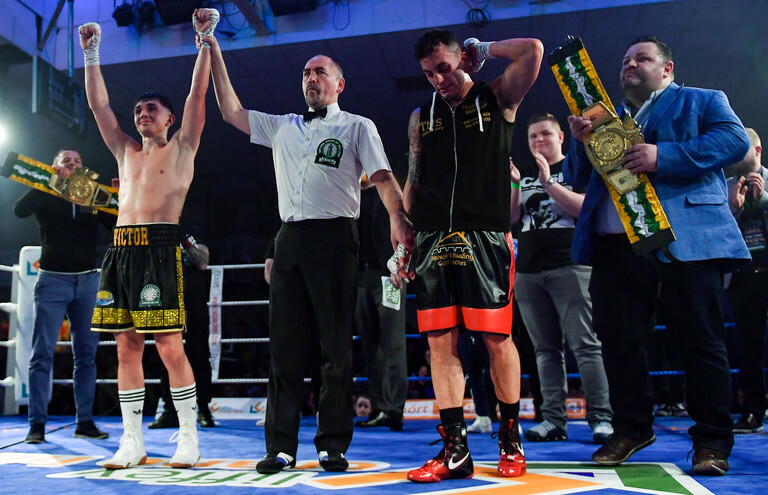 There is cruelty in the celebration, epitomised by a heartbroken Aiden Metcalfe who was willing to step up and provide an All-Irish blockbuster bout and came up short. In a different country or a different era, these young Irish boxers would develop gradually and pad their records. It's a luxury ill-afforded to the current crop. Delight for punters but devastation for those defeated. Due credit must do to McAfee to, for without him a brilliant's night entertainment would have gone unfulfilled. Tonight is Eric Donovan's night and his future looks bright. True retrieval can only come with a European title, something well within his grasp. The smile as he meandered back to his dressing room said it all, the fantasy now a reality.